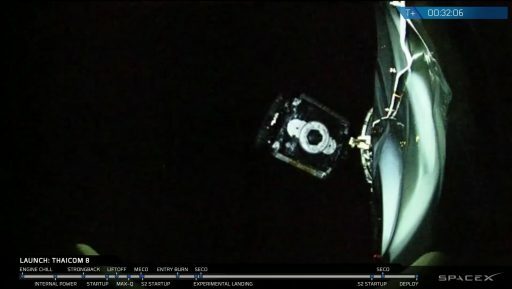 SpaceX again showcased the accuracy of the company’s Falcon 9 rocket in Friday’s successful launch of the Thaicom 8 satellite by dropping the payload off in a very precise transfer orbit and Falcon 9’s first stage sticking its ambitious landing near the center of the football-field-sized Drone Ship. 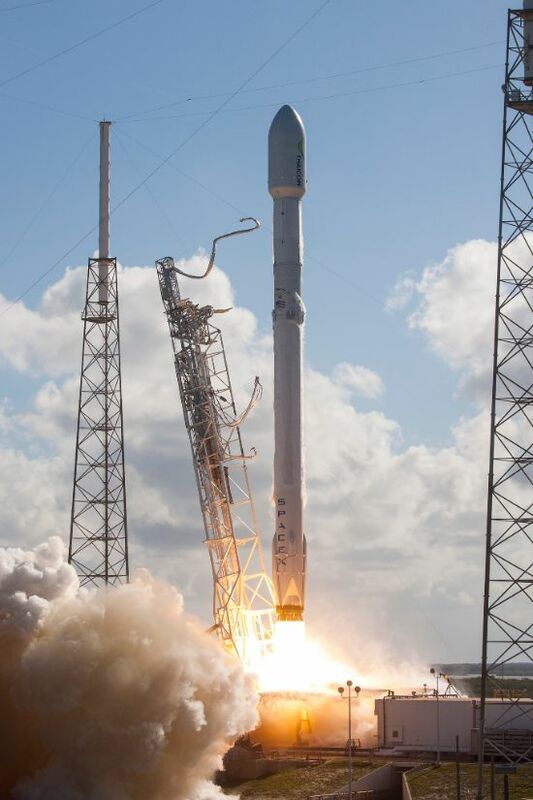 Liftoff occurred at the opening of the day’s two-hour launch window at 21:39 UTC and Falcon 9 quickly departed Florida’s space coast under the power of its nine Merlin 1D engines generating 694,000 Kilogram-force of thrust to push the 70-meter tall vehicle into the sky. Taking the standard path to Geostationary Transfer Orbit for another high-energy delivery, Falcon 9 swung to the south-east and kept firing its first stage for 155 seconds. As the two Falcon 9 stages parted ways, the first stage embarked on its next high-velocity return attempt while the second stage ignited its 95,000kgf MVac engine to push the stack to a preliminary parking orbit. SpaceX shared a spectacular sped-up video of the first stage’s journey back to Earth beginning with the stage just entering its flip after dropping away from the second stage 66 Kilometers in altitude, at a speed of Mach 6.8. 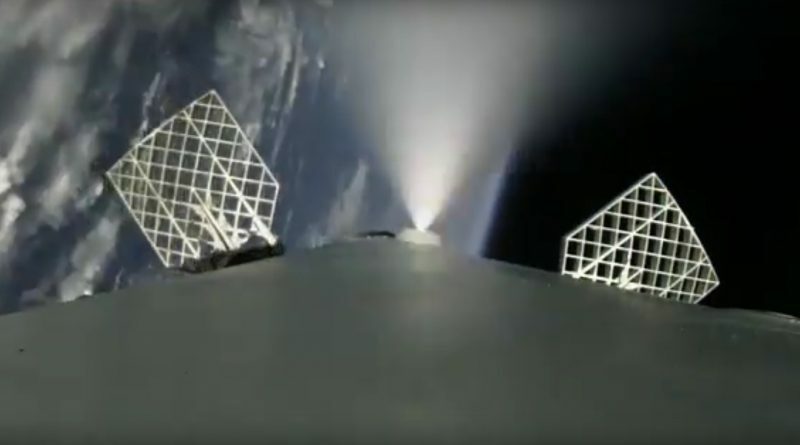 The short video begins with the actuated grid fins of the stage deploying shortly after staging and nitrogen cold gas thrusters firing to control the booster’s flight path. 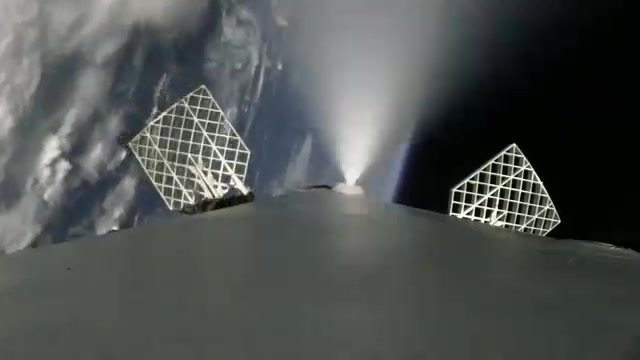 The video shows the limb of Earth moving as the booster pitched down ahead of its three-engine re-entry burn, firing for around 20 seconds to slow down before hitting the dense atmosphere. 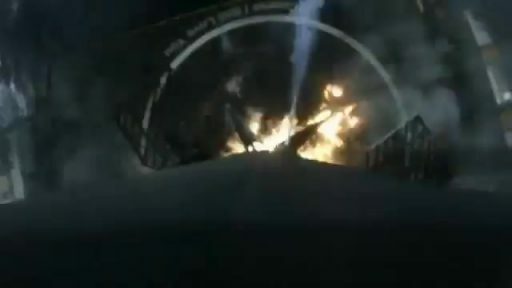 Pitching up slightly, the vehicle began feeling the effects of re-entry, visible as portions of the grid fins showed signs of fire before the camera’s field of view was obscured by smoke and fluids released by the stage in the entry process. Condensation around the grid fins is visible as Falcon 9 makes its way through the sound barrier – a critical phase of the descent as grid fins become less effective for steering in the transsonic regime. Ignition on the three-engine landing burn occurred less than one Kilometer in altitude when the booster was almost in a vertical descent towards the Drone Ship. 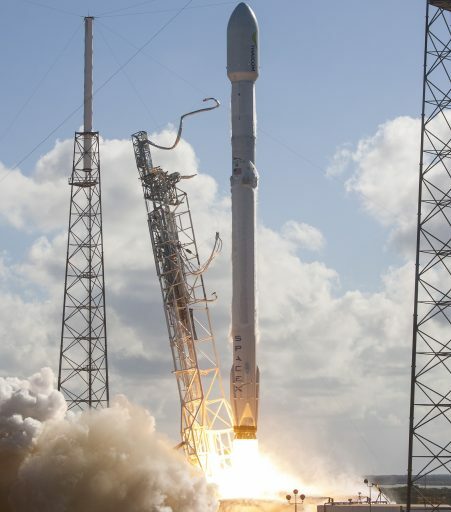 The four landing legs fold out at the same time the two outer engines are shut down for the final seconds of descent under the power of the center engine alone. The spectacular landing video ends with the grid fins transitioning to their stowed position and a big vent from the first stage LOX tank. 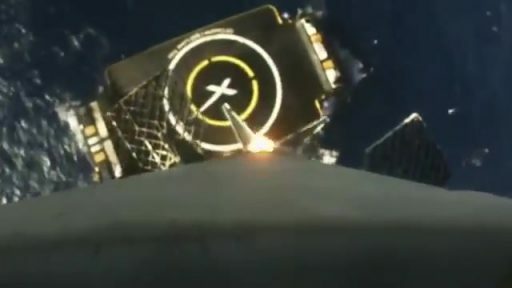 Landing on the Drone Ship was relatively hard, close to the design maximum of the first stage, causing the ‘Contingency Crush Core’ to come into action – a device Elon Musk describes as an “aluminum honeycomb for energy absorption in the telescoping actuator.” This is a replaceable part giving Falcon 9 the ability to survive corner-case landings at higher speeds. What implications the Crush Core actually crushing has on recovery operations is unknown, though the ASDS and its support vessel have been shown as moving towards Cape Canaveral at a speed of 4knots on Saturday, set for arrival at Port Canaveral early in the week. The second stage’s journey was off to a slightly rougher start than previous missions, exhibiting a considerable body rate evident in the Earth moving from one side to the other. This attitude bias was corrected immediately after MVac ignition and did not impact the mission but stood out as previous missions showed more stability during the staging sequence. 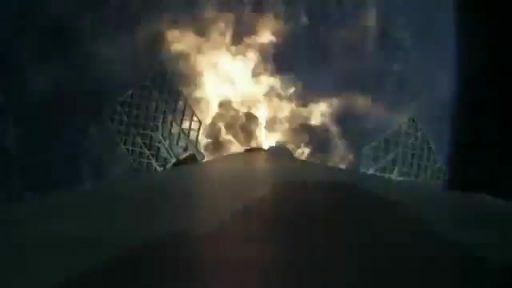 While the first stage achieved SpaceX’s third successful sea-based landing in a row, Stage 2 was in the final stages of a six-minute, ten-second engine burn pushing the stack into a 160 by 485 Kilometer Parking Orbit. 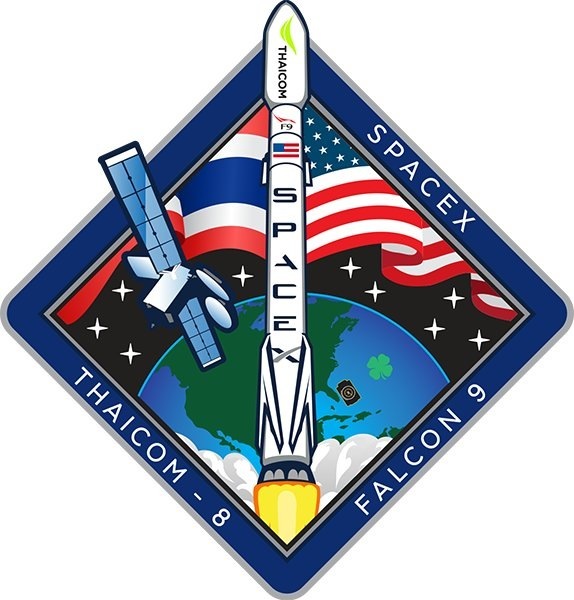 Mvac fired up again 27 minutes into the flight for a burn of 73 seconds, aiming for a Supersynchronous Transfer Orbit with a high point of 90,000 Kilometers for the release of the Thaicom 8 satellite 32 minutes after launch. The orbital parameters of the Thaicom 8 satellite match up very well with the target orbit for this launch, marking another very precise delivery by the Falcon 9 rocket. Starting out in this SSTO, Thaicom 9 will require 1,500m/s of delta-v to maneuver into Geostationary Orbit for its 15-year mission. 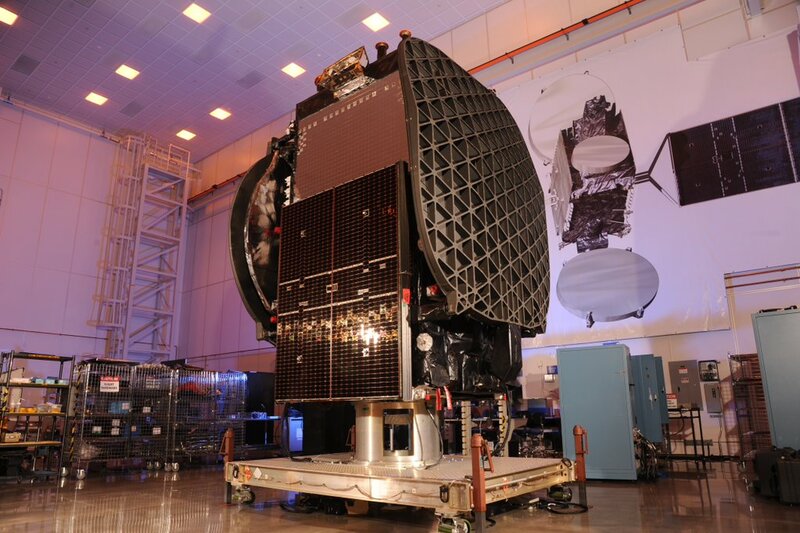 Thaicom 8 has a mass of 3,025 Kilograms and sports an all Ku-Band payload of 24 active transponders feeding three coverage zone in eastern Africa, India and surrounding territories, and Thailand. to deliver broadcasting and data connectivity services. 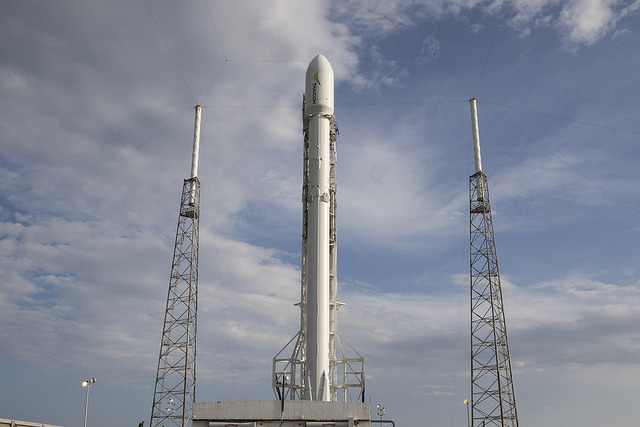 Over a period of days, the satellite will make its way into its operational slot in Geostationary Orbit, taking advantage of the extra energy delivered by Falcon 9, boosting the apogee to 91,000 Kilometers, well above the Geostationary Belt.